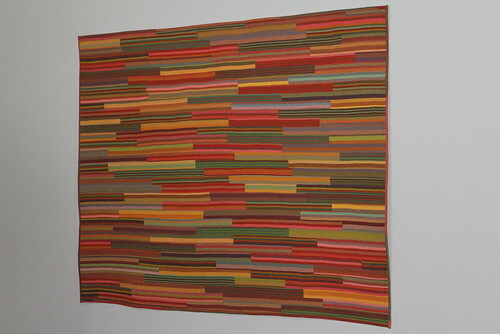 This quilt was made to add instant warmth and interest to our dining area. I quickly assembled this "temporary" piece shortly after we moved into our new home last year as our great room felt a bit cold and cavernous. I can't say that it completely did the trick as it is much too small for the space, but I've become attached to it regardless. Maybe I'll make a larger one! 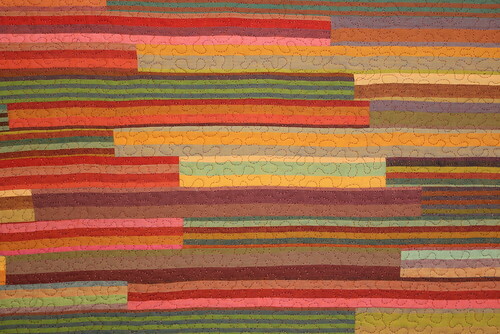 The top was made using a number of Kaffe Fassett stripes cut into 2" strips that were approximately 18" long. These were randomly sewn together end to end then side to side. 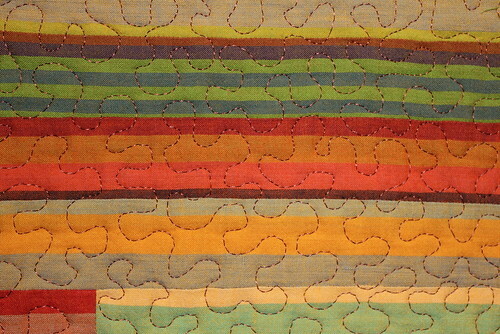 The quilting on this piece is an overall meandering pattern that I did on my Husquvarna. That took some time but was well worth it.